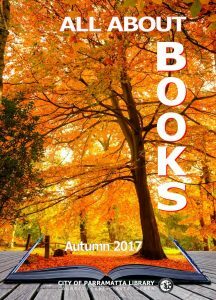 All About Books – Autumn 2017 edition is now out! The new Autumn 2017 edition of our reading guide, All About Books is now available. For your FREE copy ask a Library Staff member at any of our branches. It is filled with lots of reading ideas to inspire you over the season and has a little something for everyone…check out our special Books to Screen section, so many wonderful titles are being made into a movie or tv series this year. Can’t get to the Library and don’t want to wait until your next visit? Click on the cover to download your copy. This entry was posted in Australian Authors, Biographies, Books to Screen, Children, eLibrary, Fiction, New Arrivals, Non Fiction, Recommended Reading, Staff Favourites, Young Adult by Parra Reader. Bookmark the permalink.